Improve droop travel, drivability and tire wear as well as adjusting tire position in your wheel well with SPC’s adjustable front upper control arms for the Frontier, Pathfinder, and Xterra. Get more droop travel: SPC’s arm has improved clearance to get around the spring bucket when the arm droops, eliminating arm to frame contact on lifted trucks. The OE style sealed ball joint has an oversized ball and allows more than 80° of articulation to ensure it never binds. SpecRide™ bushings have free pivot to eliminate any chance of bushing failure seen on many high travel suspensions. Get your drivability and tracking back: When you lift your truck you affect caster and camber. SPCS’s arms have +1° of caster built into them. 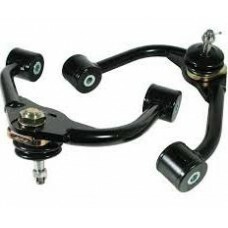 Using its patented ball joint design the arm will get you -1° to +3° of caster and ±2° of camber. To make installation easier, SPC now includes a bolt to replace the driver’s side rearward bolt, which often needs to be cut out to remove the original arm. If you need more bolts for the other positions order p/n 21035 replacement bolt kit (2 bolts). Do you need replacement cams for the lower control arm? Check out SPC p/n 87520, which will replace corroded cam bolt assemblies, or can be used on trucks not equipped with factory cam bolts for the lower control arm. These cams should be used with the upper arm kit to maximize your set-up.